It was announced last week that Digg.com, the once powerful and influential social bookmarking service, has sold to BetaWorks for $500,000 U.S. Whether you see it as a fall from grace, or are excited by the re-launch of the platform in early August 2012, exploring this history of what was once such an important property serves anyone in pursuit of Web success very, very well. Below you'll find some of the highlights of Digg's history, but if we missed one, do let us know by commenting below. Kevin Rose, Owen Byrne, Ron Gorodetsky and Jay Adelson started Digg in 2004 with a $6,000 investment from Rose. The name “Digg” was chosen because Dig.com was already registered by the Walt Disney Internet Group. Launched in stealthy beta in April 2005. The site rapidly picks up steam in late 2005 starting in October. Adelson took the position of CEO in February 2005. In mid June 2006, with roughly 300,000 registered users, the site expanded to include different areas of content - not just technology and gaming. Digg gains widespread attention by publicly exposing a 16-digit code that could be used to crack the anti-copying technology on HD-DVDs. Digg opened their API to the public in April 2007, which allowed developers to write tools and apps based on Digg’s data. In July 2007, Microsoft was selected as the exclusive provider of display and contextual advertising in a three year agreement. The site was receiving 17 million visitors per month. September 2008, Digg took a new 28.7 million round in funding, in the face of numerous clones including Yahoo's Buzz which lasted a brief 18 months. Digg unveiled its Diggbar in April 2009. The tool kept all traffic on Digg, to the chagrin of publishers, and received a less than enthusiastic response from public. In 2009 Digg integrated with Facebook Connect, which allowed users to sign in and participate with Digg posts through their Facebook accounts. The company launched Digg Ads in August 2009, which were stories that were submitted by advertisers that also included Dig and Bury buttons. In 2010 Digg launched an iPhone app and shortly after launched an Android app. While the iOS app is still available today, currently there is no Digg App for Android devices. Adelson left Digg in April 2010, and shortly after Kevin Rose became CEO. Digg Kills the DiggBar in April of 2010, and unbanned domains it had previously prevented from participating. One month later in May 2010, Digg announced a 10 percent layoff. A few short days later, Website Magazine publishes "Digg is Deadd" to great fanfare... on Reddit. Digg Went back to work, released a new Digg in August of 2010. Digg then hired a former Amazon Executive as CEO. (In September 2010, Rose was replaced as CEO by Matt Williams, who is a former general manager of consumer payments at Amazon. In October 2010, Digg slashed its staff by over one-third. Digg, not done yet, launches a site overhaul and redesign in February 2011, following that with the release of Newsrooms in September 2011. 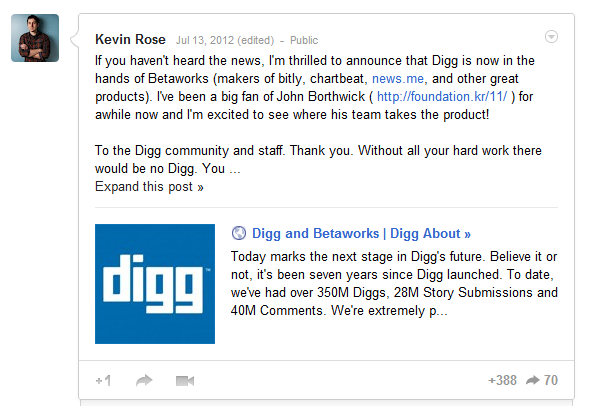 In July 2012, Digg was sold. According to various reports the Digg brand, website and technology were sold to Betaworks, while 15 staff members were transferred to the Washington Post's SocialCode project and a suite of patents were sold to LinkedIn.